Lex Luthor | The Reviewers Unite! The day has finally come where DC and Warner Bros step up to the plate and take their best swing at catching up to Marvel before being left irrevocably behind the curve. There is so much about this movie that could go right and can also go horribly wrong. It’s the first movie that not only has Batman and Superman together, but is also the first appearance of Wonder Woman. It’s taking a lot of inspiration from one of the most revered Batman stories of all time. It’s setting up a DC universe that intends to rival that of Marvel Studios. All of this CAN be great if they can pull it off, but the sheer magnitude of this release and the expectations from not only fans but the studio itself does not bode well for a director who is already hit or miss an on screen interpretation of Superman that has gotten heavily criticized. Can they pull off the impossible as effortlessly as The Last Son of Krypton would, or is this going to be an atomic bomb of a mess that will shake Warner Bros to its very core? Let’s find out!! The movie begins at the end of Man of Steel, only now we’re following Bruce Wayne (Ben Affleck) as he tries to save people in the city of Metropolis while Zod (Michael Shannon) and Superman (Henry Cavill) are having their big smack down. Needless to say that there’s not much he can do (especially outside of his Batman suit) and has to more or less sit there as the city falls apart around him due to these two men who have come from the sky and could crush all of humanity. Cut to a year and a half later, and we see a world that is very much split on Superman. Sometime between then and now there was apparently enough people who LIKED Superman to make him a memorial in the middle of Metropolis, but for the most part he’s being attacked on the news and constantly questioned about his true motivations. One such Superman naysayer is Lex Luthor (Jessie Eisenberg) who is trying to manipulate the US military and members of Congress to give him access to all the resources they have on Krypton (mainly Zod’s ship and his lifeless corpse) as well as permission to import some Kryptonite that was found in India. While Lex is working on that, he’s also working surreptitiously to undercut Superman’s acts of genuine good while laying traps and breadcrumbs for Batman (who I don’t believe he knows is actually Bruce Wayne) to become even more resolute that Superman has to be stopped before he becomes a true threat to humanity. Along the way, we’ve got Lois Lane (Amy Adams) and Martha Kent (Diane Lane) keeping Superman’s spirits high while he grapples with a world that hates and fears him (Lois is also working on a story about clearing Superman’s associate with something bad that happened in Africa), and we also have Bruce’s faithful butler Alfred (Jeremy Irons) trying to steer him on the right path and away from Superman. Still, the punch up is inevitable if the title is any indication, and the two of them have to hash out their differences before eventually working together to fight Doomsday alongside their new ally Wonder Woman (Gal Gadot). Will they be able to stop Lex Luthor and his plans to… do bad things I guess? Will the world FINALLY accept Superman after he fights ANOTHER city destroying bad guy? Are they SERIOUSLY gonna try to launch an expansive DC film universe off of this movie? Can we just get to Suicide Squad already? This entry was posted in Cinema Dispatch and tagged Amy Adams, Batman, Ben Affleck, Bruce Wayne, Clark Kent, David S Goyer, DC comics, Diana Prince, Diane Lane, Gal Gadot, Henry Cavill, Holly Hunter, Jeremy Irons, Jesse Eisenberg, Laurence FIshburne, Lex Luthor, Movie Review, Superman, Warner Bros, Wonder Woman, Zack Snyder on March 26, 2016 by Matt Vetrano. Not long ago, we got trailers for the upcoming DC Comics films, namely Superman v Batman and Suicide Squad. Needless to say that both of them have been HUGE presences in entertainment media since they’ve come out with everyone giving their two cents about the trailers and what their movies will ultimately be about, and not one to avoid jumping on the bandwagon, I’ve decided to use my little platform to give you my thoughts on them as well. Do they inspire confidence in DC’s unique direction to take their superhero films, or are they the further indication that they have no idea what the hell they’re doing over there other than desperately try to scramble together a cinematic universe after Marvel did it so effortlessly? Let’s find out!! 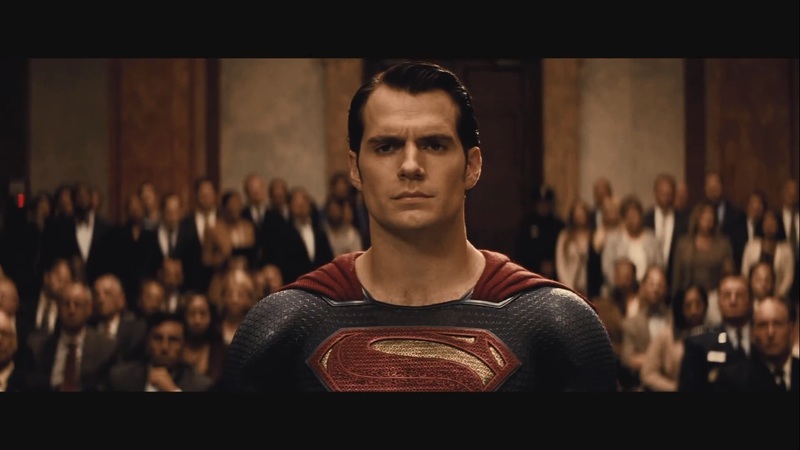 The trailer begins with what appears to be some sort of senate hear4ing where Superman is being brought before them to explain his actions in the previous film. We also get to see that Bruce Wayne was in Metropolis at the time of Zod’s attack and saw the destruction that these super humans can dish out. From there we get to see as things escalate between the two with Batman coming out of retirement (I think) to get ready to fight Superman, while Clark Kent is still trying to figure out what his purpose on this planet is (I think). If you’re wondering why I’m so uncertain about those things, it’s because the trailer does a pretty poor job conveying where in Batman’s history we are and giving us ANY reason to even give even the TINIEST of shits about Superman or understand him in any way. This entry was posted in Cinema Dispatch and tagged Alfred, Amanda Waller, Batman, Batman v Superman, Ben Affleck, Captain Boomerang, David Ayer, DC comics, Deadshot, Gal Gadot, Harley Quinn, Henry Cavill, Jai Courtney, Jared Leto, Joker, Lex Luthor, Margot Robbie, Suicide Squad, Superman, Trailer Talk, Viola Davis, Will Smith, Wonder Woman, Zack Snyder on July 17, 2015 by Matt Vetrano.